Brownkidswag -Personalized Girl's backpack. You have the option of adding a name. If you'd like a name added, then please provide the name, in the" Notes To Seller" Section. UNIQUE, SUPER DURABLE, SHOW STOPPING! and will last for a long time. It's waterproof with an adorable cartoon ballerina, this black backpack is ultra Lightweight and can be used by pre-kindergarten-primary school kids. The 3D, Black Girl Magic Princess Backpack can also used as her first purse. Lined interior features front wall pockects for your small essential items. Its back is fully padded for added support and comfort. This personalized backpack has a large main compartment to keep everything safe inside. Adjustable Strap: The Ergonomically adjustable backstraps are padded for comfort, with hanging hook for Ideal for school or days out, your child will feel like a grown up with this brilliantly designed backpack. Blended Designs: Backpacks designed with style and function. 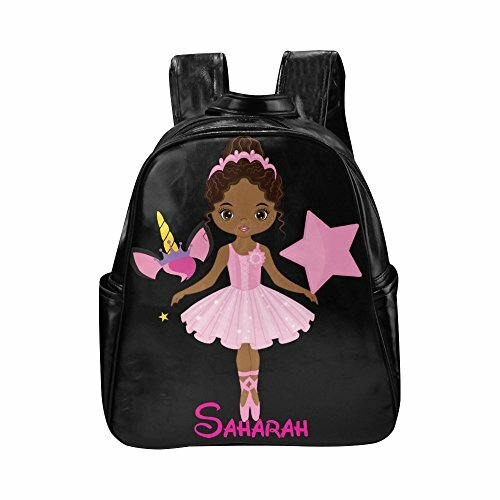 We've blended your child's favorite traditional cartoon characters with contemporary African American characters to create our unique line of kids backpacks. For adults, we also carry Travel Duffel Shoulder Bags ，Sports Gym Fitness Bags, inspired by beautiful African art, or African fabric patterns. The line for kids includes Doctors, Scientists, Princesses, Superheroes, Genies, Ballerinas Gymnasts, Cheerleaders to name a few. Check out our large selection of African American Bags, Black Girl Backpacks, Natural Hair Backpacks, Black Girl Magic Lunch Bag Totes, African Print Luggage, And & Black Girl Umbrellas. 2 Side Pockets - * Dimensions: 12.2"(L) x 5.11"(W) x 13.7"(H) *Weighs -20.1 Oz. * The main compartment has a laptop sleeve, lined interior features front-wall zippered. High construction quality: Our sublimation printing is guaranteed To Never Fade, Crack, Or Peel. UNIQUE AND FUN DESIGNS :Highly fashionable and very functional are two characteristics that we do not always find in the same product,so we've put a lot of thought and time in our all our designs. Roomy Interior: The roomy main compartment holds all the supplies your preschooler might need, with a durable, easy-to-clean lining . If you have any questions about this product by Brownkidswag, contact us by completing and submitting the form below. If you are looking for a specif part number, please include it with your message.